Beans and machines have been good for business according to one entrepreneur who’s set to introduce Kiwis to a new brew. When carefully measuring out single source coffee beans to create the perfect cup of espresso, it’s evident Reiss Gunson is a bean counter in more than one way. 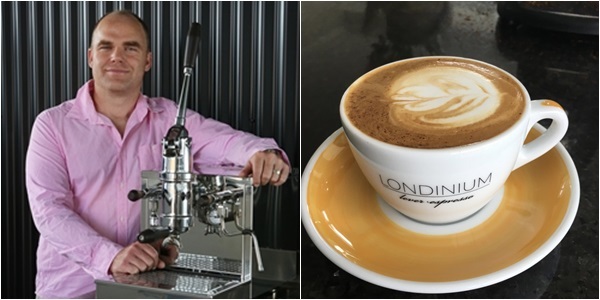 The founder of Londinium Espresso – a chartered accountant and lawyer – is committed to serving up the perfect cuppa. “We’re a small, craft business roasting the coffee ourselves and looking to bring in high end, single origin coffee for New Zealanders to experience,” says Reiss, who recently shifted Londinium’s base of operations from England to his native Auckland. “I bought my first roaster and started the business then [part-time]. A few years later I chucked in my job, working for electronics and technology company The Laird Group, to tackle the business full time,” he says. Named after the Roman word for London – where the business began – Londinium was chosen to represent English identity with an Italian connection. Carving out a niche in the market, Reiss set about supplying single source beans. He says the best way to understand the difference between single source and blended coffee is by comparing it to wine. Interestingly, Reiss says once ground, coffee can go stale within just 30 minutes; however, providing beans are packaged correctly and kept in a cool place (but not the fridge or freezer), they can stay fresh for up to six weeks. A couple of years back, Reiss saw an opportunity to move his business beyond beans. Although the company was already supplying Italian lever espresso machines, as well as grinders, he wanted to make them more accessible to home users. “I’m not an engineer, I’m a bean counter,” he quips, “What’s different with our own brand of machines is that we’ve shrunk them down so they don’t dominate kitchen space. While manufacture of the machines remains based in England, Reiss’ return to New Zealand – for family reasons – and the establishment of a showroom in East Tamaki, Auckland sees the business with a foot on each side of the globe. With the businesses infancy behind it and thanks to the internet, Reiss is set on making Londinium a globally recognised and respected brand. “Our core market is discerning individuals who’re really into their coffee and small businesses. We’re also looking forward to supplying Kiwi cafes as well,” he says.